Would a tramway bridge at Docklands work? An ongoing issue with future development at Melbourne’s Fishermans Bend is public transport, and how to link the area to the Melbourne CBD. One of the proposals is a tram bridge over the Yarra River, with an opening span in the middle to allow boats to pass. But how practical would such as structure be? 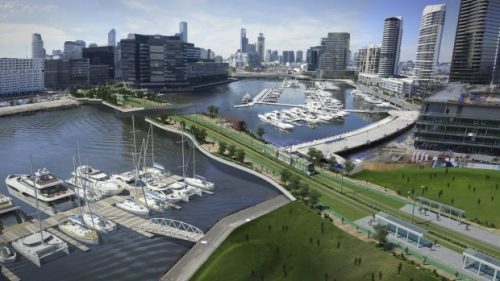 Designs have emerged of an inner city council’s plan for a new bridge for trams over the Yarra River at Docklands. The Port Phillip Council design, which would cost around $350 million to build, would include a drawbridge so that boats using a Docklands marina could get in and out. The tram bridge design has been widely circulated within state and local government circles, and Port Phillip’s detailed plan for it and the Fishermans Bend area has been leaked to Fairfax Media. An engineering expert said the design would be difficult to build, because of overhead wires and the need for a tram to always be ‘‘earthed’’ for power reasons. Lord Mayor Robert Doyle isn’t an engineer, but felt that he could still have an opinion on whether the structure could be built. ‘‘That design is the epitome of ugliness; it desecrates the Yarra and it desecrates Yarra’s Edge,’’ he said of the area of Docklands closest to the West Gate Freeway on the banks of the river. He said the proposed tram line, which would need to rise up to two or three levels in order to continue over the West Gate Freeway and reach Fishermans Bend, would ‘‘divide a community at Yarra’s Edge’’. The proposed tram line would also ‘‘ruin the only bit of open space that’s there’’. “From an engineering point of view, we don’t believe it can be built, he said. ‘‘Creating a tram-way in the air to divide a community like Yarra’s Edge’’ was a terrible idea, he said. While an actual engineer approached to comment on the proposal was a little more open minded. Engineering expert Martin Baggott, who formerly worked at engineers GHD specialising in rail design, said the drawbridge proposed as part of the plan was possible but had serious challenges. ‘‘It’s not easy because of the overhead wire. That could be surmountable, but the real problem is the return current,’’ he said. He said there were very few international examples of drawbridges for trams – he pointed to a drawbridge with a train in Malaysia, while others have raised tram bridges in Europe as examples of comparable designs. Mr Baggott said such a drawbridge posed ‘‘considerable engineering difficulties. It’s not impossible, but there are some pretty hard parts to it’’. Mr Baggott said that, if the tram line did need to rise, it would not be a big issue. ‘‘Trams can get over considerable inclines,’’ he said, pointing to a tram overpass that was once on King Street that was relatively steep. So where else can you find tramways crossing opening bridges? I went digging for overseas examples of trams crossing movable bridges, with the Galata Bridge in Istanbul, Turkey being my first find. In the USA, San Francisco’s ‘T Third Street’ light rail line crosses the Islais Creek Channel with a bascule bridge. Speaking of bridges over the Yarra, the Anderson St (Morell) bridge has an interesting story. It was the first reinforced concrete bridge built in Australia, built only 2 years after the first in the world. Also, it was built on dry land, then the river diverted under it when it was complete. That means the original course of the Yarra must have been further north, where Batman Avenue or AAMI park is now. including an old MMBW map showing the original river course on page 53. And on the subject of diverting the Yarra River – Coode Canal, Herring Island, and the lake at the Royal Botanic Gardens are other examples. I’d love to see a combined map showing the original and present course of the river. The MMBW probably have all the info necessary to make one. Aesthetic considerations sunk the proposed heavy rail line to Webb dock. The last serious proposal was for a lift bridge just downstream of the Bolte bridge, connecting to the still extant line south of the river. This was quietly forgotten about when the designers of the Bolte bridge had hysterics about the utilitarian towers of the lift bridge ruining the appearance of their bridge from downstream. So aesthetics have power – at least as far as the Bolte bridge is concerned, and rail bridges. I mean, it’s not like the new bridge is anything important, such as a road bridge. The power and earthing issues are complete nonsense. There has been at least one movable bridge with a tramline in Australia – across the swing bridge at Roselle Bay in Sydney. And this worked with trolley poles (and conductors). There have been lots of examples around the world. Yes, you’d have to do a bit of research, but, really, all bridges have design problems. That’s what engineers do – they solve design problems. A merge 10 years after the original rail link was severed for the Melbourne Docklands deevelopment! By the way, I love the name of the signal box at the moveable bridge Oldenberg. It’s called ‘Bridge’. The double deck lift span is quite impressive. If that wasn’t enough, Sydney did a freakin’ tram **ferry**, and did it nearly a century ago, so I reckon a little bridge in Melbourne is not beyond 21st Century engineers. Here it is hauling a tram across The Spit, pole up, overhead wires, and all! Thanks for those finds – both quite impressive sights. Here’s a radical idea – why not use the Sandridge Bridge for trams. They could terminate in the old boat train platform at Flinders Street, which would mean interchanging with trains would be easy. It’d mean getting rid of that cafe, but that’s fine, it’s too noisy anyway. Or if that’s a bridge too far (see what I did there), why not just use the existing tram track on Clarendon Street, and serve Fishermans Bend via the Port Melbourne line. There’s what looks like an old rail reservation running from Graham Street tram stop almost due west to Howe Parade, and from there it’s a fairly easy job to convert the old Webb Dock rail line to light rail and run trams on it. The problem I’d see with Clarendon Street is that it’s already full of route 12, 96 and 109 services – not as busy as St Kilda Road and Swanston Street, but still a stretch. As a result, the Lorimer Street route to Webb Dock was built instead. Don’t like the idea of opening bridges because it makes it hard to operate a regular, high-frequency timetable. It is entirely possible to build a bridge due west from Collins St with 9m clear over the water, or from the existing terminus due south with 25m clear over the water (ramp starting at the curve in Collins St, and return to ground level at Turner St). As for heavy rail, it is practical to run from under Footscray Rd to parallel with the Bolte Bridge, 26m clear over water, then curve around and use either the Turner St alignment or the Westgate Freeway alignment to access Webb dock. Just be patient. As soon as we’ve kicked Transurban out of the state we can start planning to decommission the Sky Road along the lower Moonee Ponds Creek (former Railway canal and before that Coal Canal) and leave the Bolte Bridge free for adaptation for trams. The Erasmus Bridge in Rotterdam was built in 1996 (so its 20 years old now), carries cars and trams, is rather low like a bridge here would be, and was built to facilitate access to a dock regeneration area. The longest span is cable stayed by a dramatic single angled support, which in turn supports a steel structure holding some of the overhead at one end. There’s a youtube video of it opening and closing. So a bridge with trams and an opening section could at least be high enough for low level craft, and have an opening section for the yachts. Id like to add I dont know why the City of Port Phillip drew a low-level park/ bridge, taking a chunk out of the riverside park, because it cant continue at ground level when it hits the freeway. It makes far more sense for it to be elevated starting on the north bank, then staying raised to run over the park, lorimer street (with an elevated stop) and the freeway, to come back down to ground at Fennel Street. (a skytram !) Though planning for ny kind of tram on this alignment hasn’t happened meaning they’ll have to buy the four storey building at 81 Lorimer Street, or run it at more of an angle across the Yarra to the other part of the park to get to Hartley Street, and then wiggle around over the freeway to Fennel Street (which can be done). Another failure of preparing for infrastructure ahead ! I don’t get it, wouldn’t it be easier just to relocate the marina and the 30 odd boats that dock there? Maybe the boat owners have friends in high places? The water way is much much bigger than those examples, such a bridge would end up being 5-10 stories tall when raised. The lift bridge section doesn’t need to cover the entire waterway – just enough to allow the expected size of vessel through.